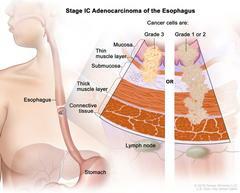 Stage IC adenocarcinoma of the esophagus; drawing shows the esophagus and stomach. A two-panel inset shows the layers of the esophagus wall: the mucosa layer, thin muscle layer, submucosa layer, thick muscle layer, and connective tissue layer. The lymph nodes are also shown. The left panel shows grade 3 cancer cells in the mucosa layer, thin muscle layer, and submucosa layer. The right panel shows grade 1 or 2 cancer cells in the mucosa layer, thin muscle layer, submucosa layer, and thick muscle layer. Stage IC adenocarcinoma of the esophagus. Cancer has spread into the mucosa layer, thin muscle layer, or submucosa layer of the esophagus wall. The cancer cells are grade 3. Grade 3 cancer cells look more abnormal under a microscope and grow and spread more quickly than grade 1 and 2 cancer cells; OR cancer has spread into the thick muscle layer of the esophagus wall. The cancer cells are grade 1 or 2.